Made from a custom high-performance fluoroelastomer, the sport band is durable and strong, yet surprisingly soft. The smooth, dense material drapes elegantly across your wrist and feels comfortable next to your skin. This two-tone band make your Apple Watch stand out among crowds.An innovative pin-and-tuck closure ensures a clean fit. The row after row of perforations improves ventilation, it is your perfect partner for outdoor and indoor sports and games, espscially in such a sweltering summer. Medium/Large, fits 170-210mm (6.7-8.3inches) wrists. 12-month worry-free warranty, unconditional warranty for a refund or replacement. Log in your amazon account > choose "Your orders" > find the order ID > click "Contact seller"
This band has sporty look, if you would like a more business-look band, the leather band will be an excellent choice. 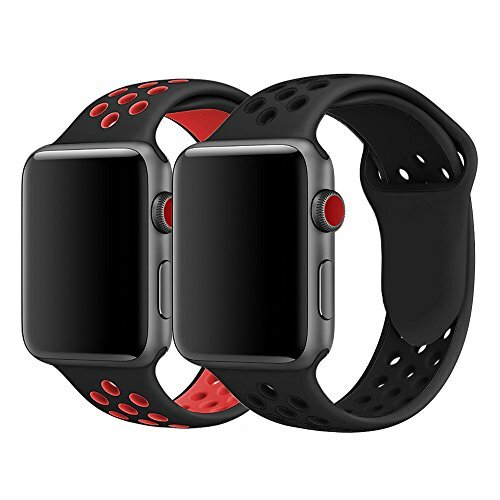 Durable& flexible: Made from the durable, lightweight fluoroelastomer., this breathable apple watch band is durable and strong, yet surprisingly soft. Dense material drapes elegantly across your wrist and feels comfortable next to your skin. Light& breathable: The band reduces weight and improves ventilation via row after row of compression-molded perforations. It is your perfect partner for outdoor and indoor sports and games, espscially in this sweltering summer. Sleek& sporty look: You should never miss this two-tone band. From work to workout, this band can always make your Apple Watch stand out among crowds yet will not cause any discomfort to your wrist. Friendly customer service: We have 12-month quality warranty for this product. For any problem or question, please contact us, we will solve it promptly and effectively for you. If you have any questions about this product by KADES, contact us by completing and submitting the form below. If you are looking for a specif part number, please include it with your message.